Snow rail is basically a snow fence for standing seam metal roofs. Snow Rail is necessary when one wants to help prevent a snow avalanche off the roof. We sell products from a variety of snow guard companies. S5! 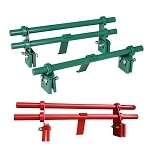 's SnoRail™ / Fence, ColorGard® and X-Gard™; Alpine SnowGuards pipe-style snow fence; Sno Gem's IClad™, Sno Blockade™, Dyna-Guard, clamp-to-seam series, and Sno Barricade® and deck mount bar snow retention systems; and Sno Shield's clamp-on or deck mount sno rail. When installing snow rail, it can be attached to the seams of a standing seam metal roof or be bolted down into a roof. Some snow retention systems use roof clamps to pinch the rib of the roof. 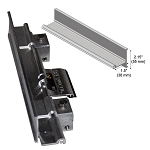 S5!® has a variety of universal clamps that allow their products to be installed on almost any type of metal roof. 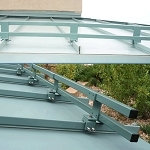 Their roof clamps use two stainless steel set-screws to pinch the roof seam. Since Dynamic Fastener is no longer a distributor of their products, all of the S5!® clamps can be found here on Roof Things LLC. We sell their products to anyone residing in the United States or in Canada. Sno Shield Inc. specializes in custom snow rail. 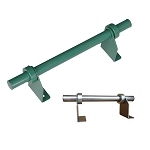 Their standard clamps are used for typical standing seam metal roofs and roofs mechanically seamed 90 degrees. They use a laser cutter to cut out their clamps. 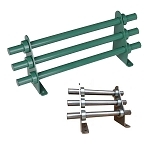 This makes it possible to create almost any kind of clamp you may need (to learn more, call us). Their products can be shipped to Canada. Please call for estimates on clamp-on style snow retention by Alpine SnowGuards (ASG3000G, ASG4000G, ASG4025, and ASG4025-mini) and Sno Gem Inc. (IClad™, Sno Blockade™, clamp-to-seam series, and Sno Barricade®). Other snow retention systems bolt down into the roof, attaching to a truss or purlin or simply screwing into the decking of the roof. Alpine SnowGuards carries products that are used for tile, slate, shingle, membrane, metal and standing seam roofs. Call or email us for an estimate on their pipe- and fence-style systems. Sno Gem's deck mounts are used on metal, corrugated, EPDM membrane, TPO and PVC, spanish and clay tile, slate and shingled roofs. Call or email us for an estimate on their snow retention systems. 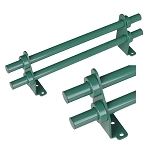 Sno Shield Inc. produces a deck mount snow rail that bolts down into metal and shingled roofs. S-5! carries products like the CorruBracket™, CorruBracket™ 100T, RibBracket™, and the VersaGard™ 47 / 67 which attach into metal roof panels allowing for the installation of ColorGard®.